Trooper Clint Rushing of the Colorado State Patrol were struck by a vehicle on Hwy. 66 near Longmont while assisting with a crash investigation and suspect apprehension. CLICK HERE to read more. 21 yr. old, Cadet Trooper Thyfault, saved the life of a tow truck driver, while losing his in the process. He is a true hero. End Of Watch: 05-23.2015. His family and classmates are devestated. Trooper Clint Rushing is badly injured, and has a long road to recovery. He has a wife, Gail, a 5 yr. old daughter, and a 3 yr. old son. THEY NEED YOUR HELP! Recovery is always costly! The FLYING WHEELS FOUNDATION is a non profit, 501(c)(3) organization, that was created by Scott and Susan Hinshaw, after they endured a financially draining recovery process, due to similar circumstances in 2007. 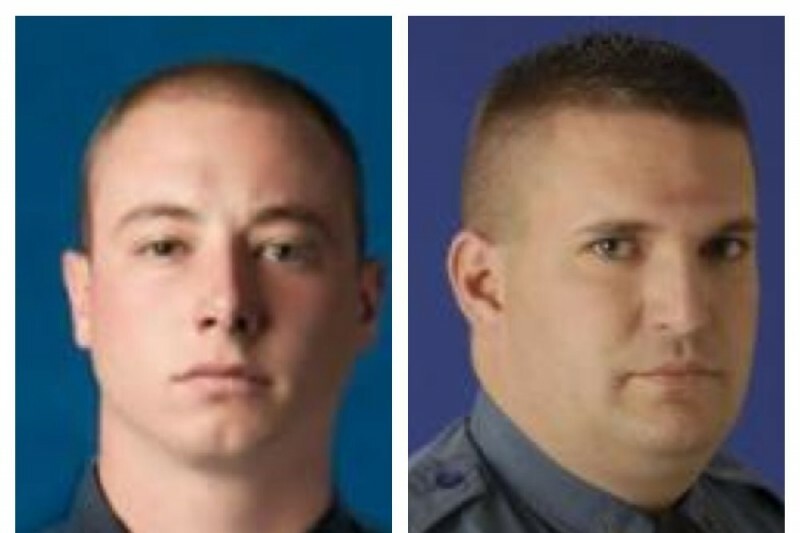 On behalf of the families of Cadet Trooper Taylor Thyfault, and Trooper Clint Rushing, THANK YOU! Together, we have raised 33,235, which will be disbursed to the families. We will leave this page up for a few more days, to maximize your efforts for the families. Going forward, Please support The Flying Wheels Foundation in the future, and check out our FB page and website. REMEMBER: EVERY PENNY WE RAISEGOES TO HELPING OFFICERS HURT INTHE LINE OF DUTY. We have no salaries to pay, and our efforts are volunteer. Today, we celebrate Taylor Thyfault! He was a young man striving and succeeding to live a righteous life, full of honor duty and respect. I'm thankful for sunny skies, and the love and support you are giving to Taylor's family. Heavy hearts at the Academy today. Grief counselor Libby Palmer, a former Cop herself, came and helped everyone understand the process of grieving Cadet Trooper Taylor Thyfault. Today was a wonderful day. Trooper Clint Rushing had a successful surgery, and is in stable condition. 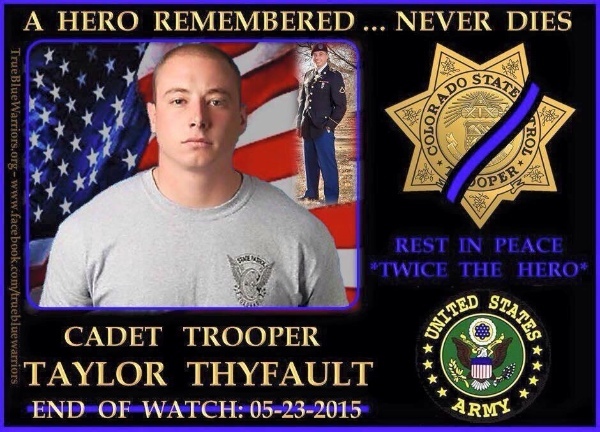 On this Memorial Day, please keep Cadet Trooper Thyfault's military service in mind. He accomplished so much, in a short time. Thank you, to him, and all Veterans! Your service is appreciated! Please divide the $500.00 / $250.00 to Trooper Thyfault Family and $250.00 to Clint Rushing Family.